Do you need an antenna rotator? Antennas are great but… they don’t get signals from every direction. The most powerful antennas, the most efficient ones, are also the ones that are the most directional. If you live far away from the broadcast towers, or if you live between two different markets, you might be wondering how you can use an antenna to get all the signals you need. You could use more than one antenna and a combiner to put the signals together. This can work as long as the signals don’t overlap, but if you need more than two locations or if there are other problems, there is a better solution: an antenna rotator. A rotator is just what you think it is. The antenna sits inside it and rotates, so it can be pointed in any direction you choose. If you remember the old days when your dad or granddad had an antenna, you may think of a rotator as old, slow and imprecise. This antenna rotator is much more modern. 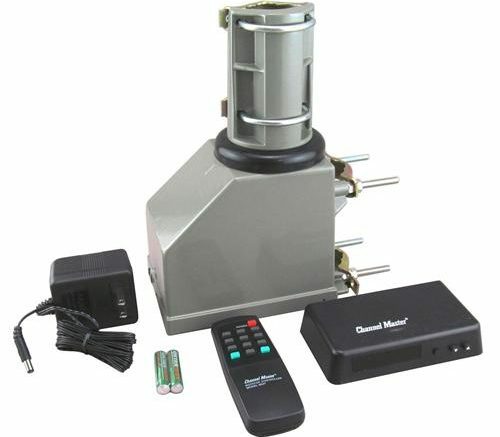 This is the Channel Master 9521 Antenna Rotator. Installation is easy: the antenna straps inside and the rotator straps to a mast. You’ll find that it comes with all of the hardware that most people would need to install. It’s electrically powered, so you will need a power source for the power “wall wart.” A low-voltage cable goes between that and the rotator.. Beyond that, using it is easy… it has a remote control so once it’s installed you won’t find yourself adjusting it on the roof very often. The remote has 69 presets, so you could aim your antenna for every over-the-air station you could possibly get. The base unit has memory, so if you lose power it will remember your settings. All you have to do is find the best possible aim for each channel and set it into the rotator. The downside of a rotator is that if you have multiple TVs, they all get the same signals, so if one of you wants to watch a show from Milwaukee while the other one wants to watch a show from Chicago, it doesn’t work out very well. In a case like that, you’re better off using two antennas, pointed in two different directions, or an antenna like our HDB8X that can pick up channels from two very different sources. Another thing to know is that rotators don’t last forever; they have high-quality motors but they do operate outside and sometimes the weather can take its toll. It’s common to get 3-5 years from a rotator, sometimes more. If you’re ready to upgrade your home’s antenna setup with a rotator, give us a call at Solid Signal, or shop SolidSignal.com’s excellent selection! Can you combine indoor antennas?